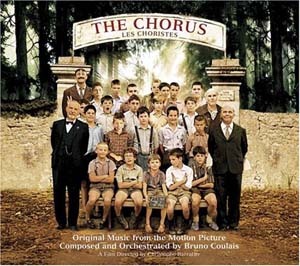 Les Choristes (The Chorus) is a movie that has taken its native France by storm and Bruno Coulais’ simple, though memorable score must take some of the credit for the appeal of the film. Coulais has composed one of the most charming scores of the last few years. The film itself involves a humble, kind-hearted music teacher in post-World War II France who takes up a position as a teacher at a reform school; an all-boys school filled to overflowing with the wayward sorts usually found in schools of this type in movies. The school is run with an iron fist by the headmaster but our teacher believes that with kindness and encouragement – something that the children have been severely lacking so far – he can turn these boys around through their exposure to music via their involvement in a choir. Though this storyline is nothing new (think Mr. Holland’s Opus, etc), Coulais has fashioned a marvellous score through the integration of the boys choir performances with a conventional orchestral underscore. The score is filled with memorable melodies, simply stated, using both Coulais’ own compositions and cues that incorporate thematic ideas from the film’s director Christophe Barratier. Jean-Phillipe Rameau’s “La Nuit” and the traditional “Compère Guilleri” are also featured on this selection. The score itself features 2-3 main thematic pieces that appear several times throughout the playing time of this CD, each theme appearing in several orchestrational arrangements. “Les Choristes”, which could be called the main theme of the score, kicks off the CD in a grand fashion with Jean-Baptiste Maunier’s excellent solo singing and the assembled boys choir setting out the sound for the rest of the score. The featured song, “Vois Sur Ton Chemin”, appears later in the score on track 5. Another highlight is the theme first featured in “Pépinot”. A theme mainly heard as orchestral underscore, it’s a delicate, versatile theme that with various orchestrations evokes feelings of optimism (piano & strings, “Pépinot”) or sadness (harp, woodwind & strings, “La Désillusion”); sometimes even both at the same time – as heard in “L’Evocation”, Coulais’ expert handling manages to suggest memories of happier times from a point of sadness. Coulais’ use of Latin Requiem text in “In Memoriam” is another thematic highlight. Much has been made of the excellent vocal cues featuring both soloists and choir – and rightly so. But Coulais’ orchestral underscore is just as memorable. Again, Coulais’ use of various sections of the orchestra add colour to the thematic material. The use of ominous and dramatic string (“L’Incedie”) and brass (“Les Partitions”) are very effective. The dramatic strings heard in “Action – Réaction” is very reminiscent of some of Ennio Morricone’s own dramatic string passages. In these orchestral cues, Coulais uses wordless choir to add emotion: in the first orchestral cue, “L’Arrivée à l’École”, a Danny Elfman-inspired wordless choir instils a mysterious aspect to the arrival of the new teacher; suggesting almost the boys’ potential or perhaps more importantly the potential of the teacher. Interestingly, this same wordless choir motif is repeated later in the score in “Seuls”. The short, but beautiful “Cerf-Volant” features a theme suggestive of some sort of release/freedom (also featured in “Les Avions en Papier”). This idea of freedom or release from, perhaps, the everyday routine is a concept frequently reinforced by the orchestrational make-up of some of the cues themselves. For example, in “Les Avions en Papier”), the cue begins with a piano accompaniment to the choir; a situation found in almost every school production. As the cue progresses, the introduction of the orchestra seems to lift the piece from being a diegetic (source) cue to a non-diegetic cue; the power of the music providing a release from their situation. The removal of the orchestra leaving the piano and boys choir as the cue ends brings us back to the here and now. The CD end with the unexpected inclusion of dialogue from the movie – but, I found this to be less intrusive than I would have thought. For example, “Morhange” features a lovely rendition of the “Les Choristes” theme featuring choir and strings. The appearance of dialogue during the middle, woodwind passage gives the feel of a cue taken from a French language musical. “Nous Sommes de Fond de l’Étang” features what sounds like various auditions for the choir from several of the boys. It is less of an intrusion as it sounds and in fact it would not have seemed out of place at the beginning of the CD; auditions for the CD before leading into “Les Choristes”. However, I can’t help but picture Nibbles, the baby mouse featured in the Tom and Jerry cartoon entitled “The Two Mouseketeers” when hearing some of the boys’ audition pieces! The CD presentation from Nonesuch is excellent and features a 16-page booklet that lists the lyrics from the songs in both the original language (Latin and French) and with English translations. Listeners may find much of this score repetitious with the 2-3 themes being used in many of the cues. However, the overall effect is so engaging that it’s 40-minute playing time just flies by and leaves a wonderful feeling in the heart.